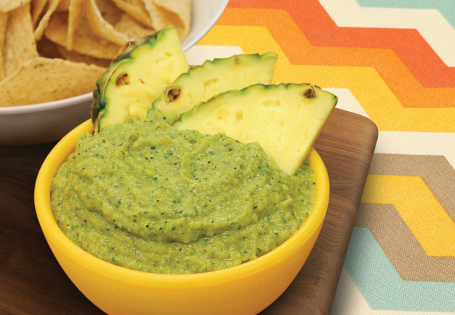 A rich healthy dip that's a great alternative to guacamole and salsa. Cut onions in half and separate layers. Grill jalapeños, onion layers and pineapple, rotating until evenly blackened. Refrigerate for 10 minutes. In a food processor, combine all ingredients and blend until smooth. Best served chilled. TIP: The jalapeño, onion and pineapple can also be roasted over an open flame on the stovetop. Be sure to rotate often as the heat is much more intense.